I don't know about you, but I ALWAYS love a good dip. My pant size says it's possible that I love dips a bit too much. I've made a few Mexican inspired dips, but all of them have been served hot. It was nice to change it up & make a cold dip...especially knowing my fiends and I would be chowing on this next to the pool on a hot summer day. The original recipe was found at a little north of crazy. I modified her "Gone in a Blink Nacho Dip" by adding seasoned ground turkey. 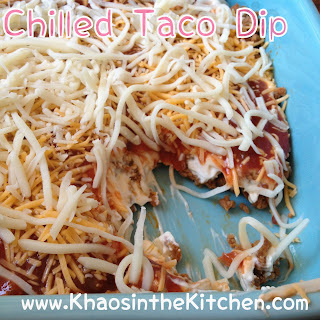 To me, it became more of a "taco" dip than nacho...but does the name really matter when you taste AWESOME? No, it does not. It was super easy to make & my friends gobbled it up QUICKLY. I considered adding a few veggies to the dip, but then felt it was better to keep it simple. This will definitely be made again! In a large skillet, brown the ground turkey then drain. If your meat is unseasoned, once turkey is browned, drain & mix 1 package of seasoning. Once meat is cooked & seasoned, place evenly in the bottom of a baking dish. Place meat in the fridge for 20 mins to cool. While meat is cooling, in a medium sized mixing bowl, combine cream cheese, sour cream until completely mixed through. Add in 1/2 pkg taco seasoning & mix well. Once the meat is completely cooled, spread the cream cheese sour cream mixture evenly over the meat.